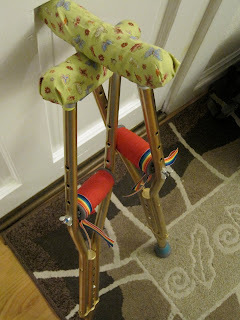 It took month, but the doctors finally figured out the reason our girl has been limping and wincing in pain since Valentine's Day. A hairline fracture of her femur! Yikes. Either she has a very high tolerance for pain or this is minor and will heal up now that we can actually treat her for it. 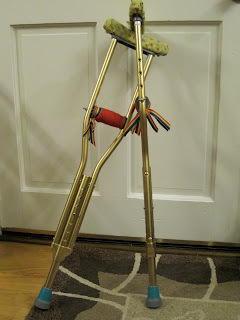 I may have a rant about non-communicative doctors at some point in the future, but for now I'd rather focus on helping Elise with her freshly painted GOLD crutches. A snazzy girl deserves snazzy supports there. I hope giving that femur some extra support quickly sends the pain packing. Love to you all.